After a year of planning, the International Student Organization (ISO) held their fifth annual ISO Gala April 14. The event served $5,628.65 to support women who are victims of sexual assault in the Democratic Republic of the Congo. The club sold 140 tickets for the event and also received money in the form of donations or from the silent auction that featured student and local art. The event featured student performers of musical performances and spoken word, including Talibah Aquil, Meechy Jay, Willow Run, and Earnest Kiah and Bruce Cypress. Diana J. Fox, an anthropology professor at Bridgewater State University in New Jersey, delivered the evening’s keynote presentation. She highlighted many of the roots of patriarchal society and how gender norms and the oppression of women is continuing. Her speech captured many of the ways in which women are oppressed around the world. The club recognized seniors Emmanuel Kampanga, Phoebe Coffie and Angel Mallard with the ISO Excellency Award. Though this was the club’s fifth gala, junior Paul Kayembe, ISO president, focused on the gala as a key event. The previous gala “was more of a surprise than anything,” Kayembe said. Read more about the event here and view photos. Throughout the school year, ISO hosted different events like Professor Storytime, with each one promoting the gala. This allowed the club to sell tickets and gauge how well they were selling. Even in the final weeks leading up to the gala, the club had to change their strategies for selling the tickets. The year-long process came with plenty of challenges and doubts. “Financially, we faced a lot of hurdles,” Kayembe said. Though the club received some funding from the Student Government Association, the majority of the money had to come from sponsors. The club worked hard to go around the community, finding sponsors and donors for the gala. Kayembe hopes that more students will come to future ISO events. “This event was the first step [towards] earning their respect so that next year when we come with this same … ambition, they will not hesitate,” Kayembe said. 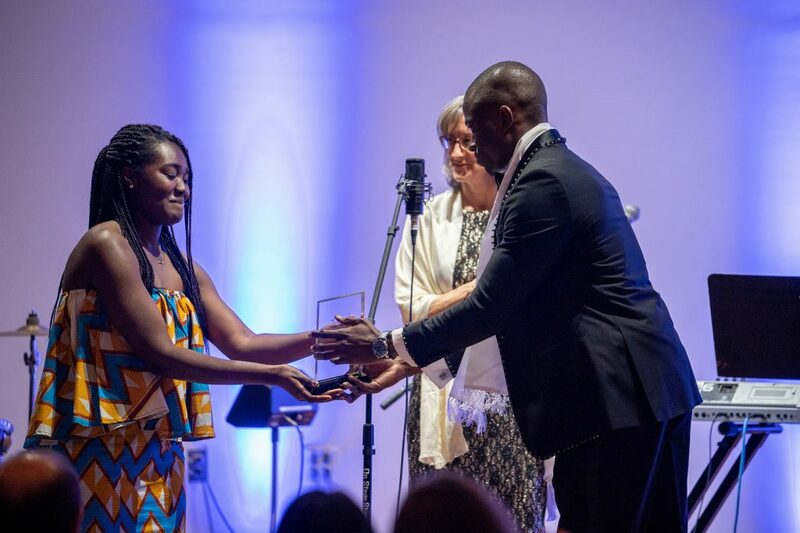 In a wrap-up email, Kayembe recognized the group efforts of the following members: Adila Wahdat, Akiel Baker, Alejandra Rivera, Ally Coffey, Aminata Wallet Mohamed, Angel Mallard, Arnold Muthoki, Ayu Yifru, Brandon Higgins, Cela Hoefle, Daniel Moyer, Emmanuel Kampanga, Gillian Zehr, Heyrin Cha, Kevin Sungu, Linda Ouedraogo, Louisa Quaynor, Mario Hernandez, Maya Dula, Michaela Nichols, Phoebe Coffie, Rebecca Yugga, Skyy Brinkley, Winifred Gray-Johnson, Xhorxhina Ndoka and Micah Shristi (advisor). Portions of this article originally appeared in April 19, 2018, issue of The Weather Vane. Read more about ISO’s annual event below.